Every year since the 1997 the University of Connecticut has hosted the Edwin Way Teale Lecture Series on Nature and the Environment. The series features distinguished natural scientists, social scientists, authors, artists, performers, and policy makers whose work informs our understanding of nature and the environment. The lectures are free and open to the public. Many lectures in recent years are also available online. 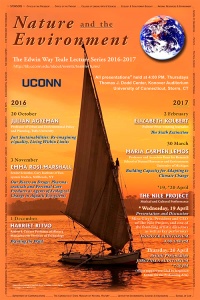 You can find the full list of past lectures and links to videos (where available) at this link: http://lib.uconn.edu/about/events/nature-the-environment-the-edwin-way-teale-lecture-series-past-lectures/. The dates and times for the events are available on the Teale Series website. If you are close to Storrs, please stop by and join us. If you are far away or other commitments mean that you can’t join us, please check back to see if a recorded version of the presentation that interests you is available online.